I just don't seem to be able to get much done at the moment but this is top of my blog 'To Do' list so getting this posted is good! Edit: I actually wrote this post a week ago and have just got the photo sorted so you see what I mean about getting things done!!! So the candy...having passed my birthday, husband's birthday and 10,000 hits I've decided I'd like to share the love with 3 people who will each get a new set of Inkadinkado or Stampendous stamps, set of PaperMania sticker alphabet, mixture of Dovecraft 6x6" (15*15cm) papers, mixture of PaperMania 2x12" (5*30cm) papers plus an assortment of brads, ribbons, buttons, images, etc. It's not all shown in the photo but I hope you get the idea. Can't give everyone something but I like the idea of more people having a chance. And I say a 'mixture' of papers because I think splitting packs so everyone gets a good mix of lots of different things is better than getting lots of the same. Hope you agree :) To join in is easy: Please post or leave a prominent link on your blog (or other place) to this post and then comment here giving me a link to where to find it. I visit all comments because I love seeing your blogs. I'm not doing this to up my follower rating etc so that's not necessary though of course you are welcome to if you wish, and then I'll know it's for genuine interest ! I'll post worldwide - I love seeing where everyone comes from and I'm grateful for an international audience. Thanks for helping me reach over 10,000 hits: I hope I can inspire you to come back again. Candy closes 31st May. 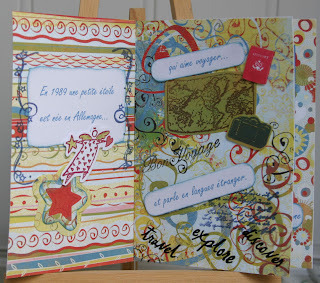 Pour fêter les 10000+ visiteurs de mon blog, je propose un lot pour 3 personnes : Dans chacun de ces 3 lots : 1 planche de tampons Inkadinkakdo ou Stampedeous, un lot de stickers alphabet PaperMania, un mélange de papiers 15x15 cm Dovecraft, un mélange de papiers 5x30 cm PaperMania et un assortiment de brads, rubans, boutons, images, etc. Laissez un commentaire ici : Je vais tirer les lots au hasard le 31 mai : Bonne chance et merci à tous ! This is stuck at the top of the blog so please scroll down for more recent posts. 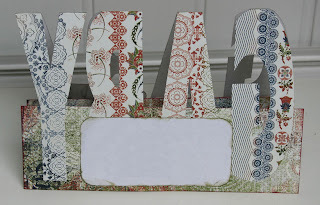 'Name' card - Easy one for men! 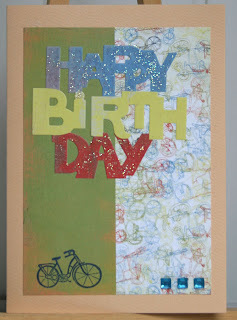 Here's my brother's birthday card, inspired by one by Dee Paramour on p70 of this month's 'Making Cards' magazine. 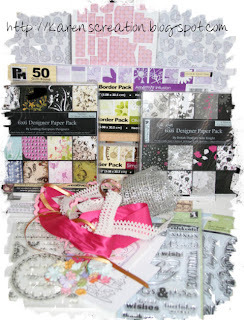 Used: Basic Grey 'Boxer' collection with the Eazi-score board and a template created by printing the name on paper; Colorbox chalk inks; eyelet and Big Bite; ribbon from stash. 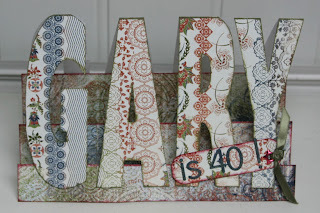 I also went over the 'is 40!' from the alpha sheet of the pack with a Sakura Stardust pen to highlight it. 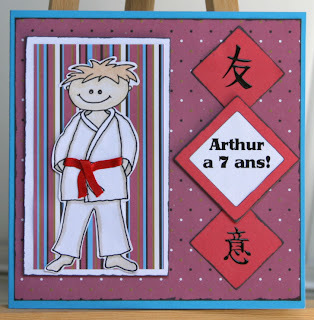 Voici la carte pour l’anniversaire de mon frère réalisé avec des papiers et l'alphabet de Basic Grey ‘Boxer’, Eazi-score board, des encres craies de Colorbox, un œillet & le ’crop-a-dile big bite’, et un morceau de ruban. Here's my card for the 'Cute Card Thursday' challenge 61 'A Sporting Chance': I was asked to make a card for a boy who does karate so, after much searching for something suitable, I lightly traced a image of my footballer stamp in pencil then drew in pen the karate outfit to the same height but a bit thinner and then cut out the head of the stamped image and just used that over the top. I then threaded some thin ribbon through to act as a belt. Voici ma carte pour ce challenge « Cute Card Thursday » avec le thème du sport : J’ai dessiné le costume de karaté moi-même et j’ai utilisé seulement la tête de mon tampon d’un garçon de foot. Used: Whispers markers for colouring; PaperMania papers; Colorbox charcoal chalk ink for edging; PaperMania squares and frame; printed text using 'Torii' font and peel-offs (which say 'friend' and 'imagination' in Japanese kanji text). Don't forget to have a look at my candy here - open until 31st May. Cette semaine chez « Carterie de Sandrine Vachon », il fallait réaliser une carte selon son sketch 49. 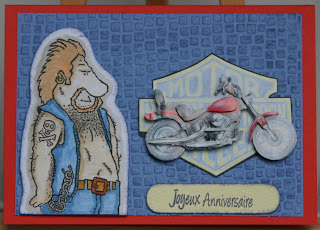 J'ai utilisé pour faire ma carte des papiers de Basic Grey ‘Cupcake’ avec un embellissement du cycliste et tampon sentiment de Compagnie des elfes. Elle est plus masculine que des cartes du DT et j’ai changé les dimensions du sketch mais tous les éléments sont là. 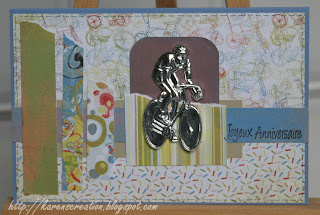 Another take on the cyclist embellishment on Basic Grey 'Cupcake' with a sentiment stamp from 'Compagnie des Elfes'. 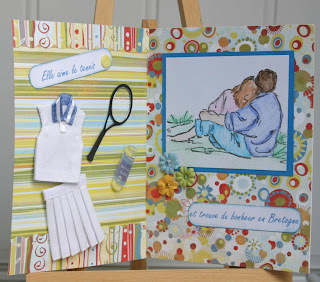 This one follows sketch 49 on a french blog by Sandrine Vachon. I have changed the dimensions and it is certainly more masculine than the DT examples but all the elements are there. 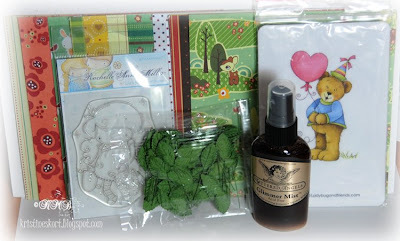 Kristine has lots to celebrate and lovely candy on her blog but you'll need to be quick as that finishes today. 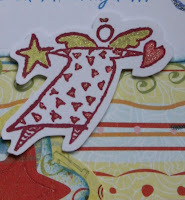 Her blog is always worth seeing though: Lovely cards and also great photos and Photoshop tutorials. 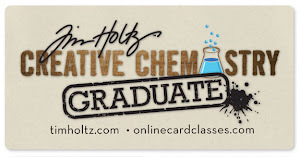 I also discovered a new challenge site which looks really exciting as it promises to give info and tutorials too, so is aptly called 'The Next Level'. Co-hosted by one of my old Funky Fairy Papercrafts team mates, Dawn, whose work is fabulous so I am sure it will be good. It all gets started on June 1st and they have 2 prize packs that will be drawn that day so hop over now, have a look and help spread the word. 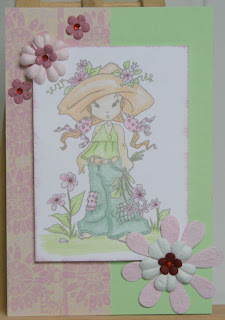 A simple everyday card using a Sugar Nellie stamp ‘Sweet ‘n’ Sassy’ coloured with Whispers markers and highlighted with white gel pen and Sakura 3D ‘Glaze’ and 'Stardust' pens; inked with Brilliance, mounted on PaperMania paper and a green card blank and finished with Prima flowers and Anita’s gems. Voici une petite carte très simple. 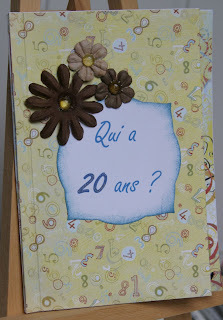 J’ai utilisé le tampon "Sweet ‘n’ Sassy" de Sugar Nellie ; colorisation : Whispers marqueurs ; fleurs de Prima avec des pierres de Anita’s, papier de PaperMania. 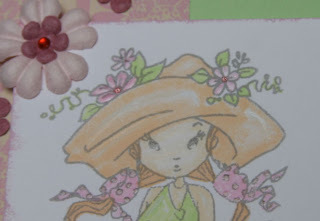 Finition : blanc stylo pour hi-lites ; laque effet 3D : stylos ‘Glaze’ de Sakura; et stylos 'Stardust' de Sakura. 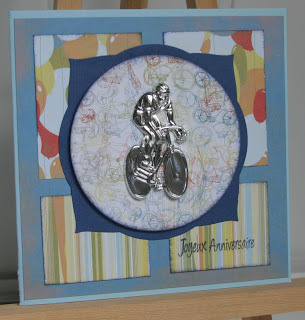 Here's a card following today's sketch from 'Just Christmas and Birthday cards' blog using an embossed cyclist. I bought a big bag of these ages ago so got round to using one today, along with Basic Grey 'Cupcake' papers and the Cuttlebug with Nestabilities Circles and Labels 3.I hope it falls in to 'simple but effective' but looking at it now I wish I'd put a brad or something in each point of the Labels 3 layer. 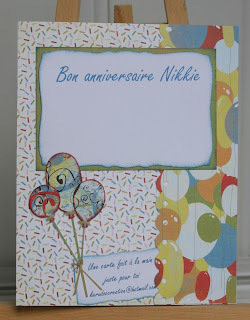 Cette semaine chez 'Just Christmas and Birthday Cards' il fallait réaliser une carte d'anniversaire ou noël selon un sketch. Voici mienne réalisé avec des papiers de Basic Grey 'Cupcake', embellissement du cycliste et des matrices Circles et 'Labels 3' de nestabilities sur ma Cuttlebug. It was quick because I'd already got the découpage made up (about a year ago!) waiting to be used. I found the biker on the Internet and changed him to suit the look I wanted (more hair, fewer tatoos) and then printed and coloured him with Whispers markers. I used the Cuttlebug Mini Mosaic folder and Colorbox chalk ink (Iris blue from Chocolate & Blueberries) direct to the paper for the background and mounted the man and sentiment (from Compagnie d'elves) with 3D foam. 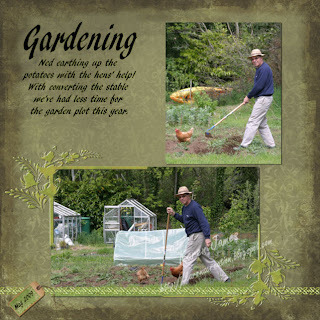 It's been ages since I had a digi-play but rattled up this in Paint Shop Pro from a couple of photos of my husband that I took yesterday and some Scrap Girls supplies. The original background paper is dark brown and the frame is magenta red but it's digital so I changed them and threw in some extra layers, text and drop shadows while I was at it! Oh boy, where did that week go?! I didn't miss that my blog turned 10,000 hits: Thank you all! I promise blog candy is coming soon, as soon as I can get a pic and myself organised. It was husband's birthday on Tuesday and, of course being the loving wife and card-maker that I am he got a super-duper card? Well no! Being me, I left it to the last minute, got a request for an order in a hurry, mouth said 'Yes' while brain was thinking 'No' and poor hubby got a very rushed card! He liked it though, just wanted to know why the bike I'd stamped was a woman's version? I hadn't noticed!!! Both papers and the sticker (to which I gave the glitter glue treatment) are Basic Grey 'Cupcake', bike stamp from SeeDs set 'Boys Toys'. Well the request was from the woman who I'd made the 50th card for so I was thrilled she liked it so much! This one was for a 20th - their son's girlfriend - and I received notes on what to include: Born in Germany, living in Switzerland, speaks English, loves tennis, about to live with her boyfriend nearby to improve her French... I settled on making a little book/card, keeping it fairly flat to get through the post easily. I stuck 6 pieces of Basic Grey 'Cupcake' back-to-back to form the main pages and then glued them together at the spine I created with my Eazi-score board. I printed the 'storyline' of the card and cut that with Nestabilities, stamped other images and text from Inkadinkado and Hampton Art, coloured with Sakura Stardust and Glaze, added BG 'Cupcake' stickers... 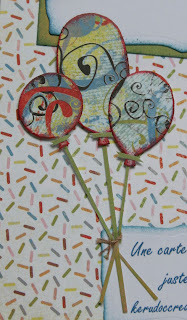 I used Jolees stickers for the tennis page, Stampin' Up 'Summer by the Sea' image, which I water-coloured, prima flowers, Anita's gems, and finally... ...layered the offcuts of paper on the back page, punching with Fiskars 'Threading Water' and Cuttlebug 'Birthday' balloons die. I spent ages getting the balloons on their stalks with the fiddly fake ties on the balloons and really tying them together at the bottom with thread but I'm really pleased with how they came out: That went off on Tuesday for her birthday today: Hope she likes it!